Australian skinks abound in Cape York. This is the largest group of reptiles in Australia, with at least 375 species. They are also very common to see in Cape York - if there is a little lizard walking in the leaf litter, most likely it is some kind of skink. 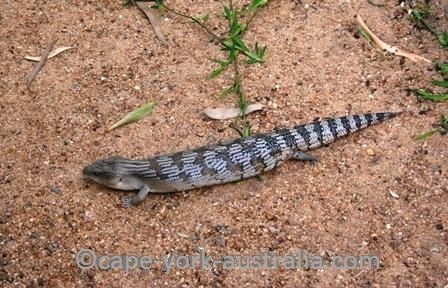 The largest, and best known, are of course the blue tongue skinks, but there are many, many more smaller ones. The best known Australian skinks, blue tongue skinks are found in northern Australia, and the eastern blue tongue skinks Tiliqua scincoides are found in north Queensland and on the southern Cape York peninsula, between Cooktown in the north and Cardwell in the south. Similar to blue tongue skinks, these beautiful Australian skinks are found along the eastern coast of Australia, in the areas in and around Cairns, Ingham and Mackay in north Queensland, and even Sydney in New South Wales. Pattern and looks similar to the species above; juveniles can have stronger banding. Both stocky, with almost stumpy tails, and no cross banding or quite as triangular heads as the species above. Major skink is found in rainforests, woodlands and open forests from Torres Strait in the north and New South Wales border in the south. 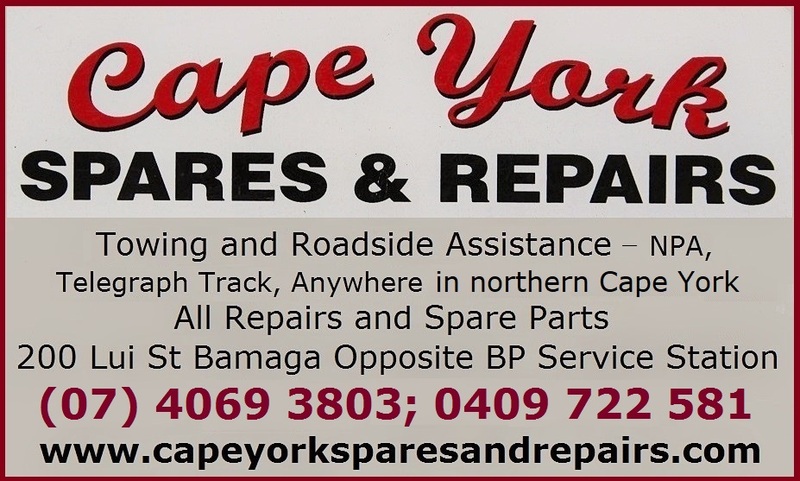 Yakka skink is found in dry open forest from eastern Cape York peninsula to south east Queensland. Eastern water skink Eulamprus quoyiiis found between Cooktown and Mackay in Queensland, as well as in Victoria and South Australia. Related Australian skinks we have in Queensland are Eulamprus tigrinus, Eulamprus luteilateralis, Eulamprus brachysoma, Eulamprus sokosoma, Eulamprus frerei, and Eulamprus tenuis. 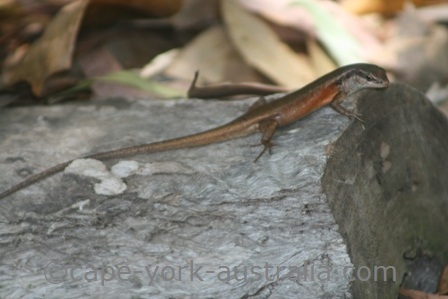 There are two species of dwarf Australian skinks in tropical north Queensland - Menetia sadlieri and Menetia timlowi. Both are found from north eastern to southern Queensland, the first on Magnetic Island outside Townsville, and the second near Mt Garnet in the southern Cape York peninsula. Fire tailed skink, Morethia taeniopleura, some of the most beautiful Australian skinks, with a brown body, red tail and a darker stripe, surrounded by narrower, white stripes, along the sides of its body. It lives in woodlands of north Queensland, from Cooktown in the north to Bowen in the south. Sun skinks belong to Lampropholis and Lerista species, and in north eastern Queensland we have Lampropholis delicata (Mt Molloy to Mackay), Lampropholis robertsi (Cooktown to Ravenshoe), Lampropholis adonis, coggeri and mirabilis (south of Cape York); as well as Lerista colliveri and Lerista zonulata (south of Cape York peninsula). Shade skinks are Saproscincus species and the ones found in Cape York area include Saproscincus basilicus (Roaring Meg Falls to Cape Tribulation), Saproscincus lewisi (Helenvale to Cape Tribulation, and Saproscincus tetradactylus (Mossman Gorge to Paluma Range National Park). Striped skinks belong to Ctenotus species, and in Cape York area we have Ctenotus monticola (Mareeba), Ctenotus robustus (Cooktown area), Ctenotus spaldingi (Cooktown to Chillagoe), Ctenotus nullum (Cooktown, Laura, Black Mountain, Shipton's Flat) and Ctenotus taeniolatus (Cairns area). Rainbow skinks belong to Carlia species, and in Cape York area we have Carlia jarnoldae (Heathlands), Carlia Longipes (Cooktown), Carlia mundivensis (Chillagoe), Carlia pectoralis (Mt Molloy), Carlia rostralis (Laura), Carlia schmeltzii (Weipa, Cooktown), Carlia scirtetis (Black Mountain), Carlia Storri and Carlia vivax (Cooktown). 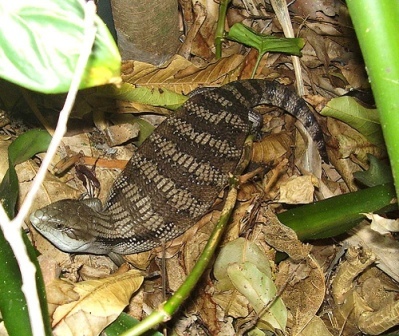 Litter skinks belong to Lygisaurus species and and in tropical north Queensland we have Lygisaurus aeratus (Cooktown, Coen), Lygisaurus laevis (Cooktown to Bramston Beach), Lygisaurus tanneri (Cooktown, McIvor Ranges) and Lygisaurs zuma (Paluma to Mackay). 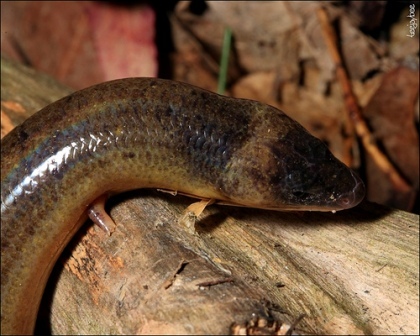 Worm skinks belong to Anomalopus species, and what they have in common is that they have very small, short or absent limbs. In north eastern Queensland we have Anomalopus gowi (Mt Garnet, Townsville area), Anomalopus brevicollis, and Anomalopus verreauxi (both roughly in Mackay and Clermont area). 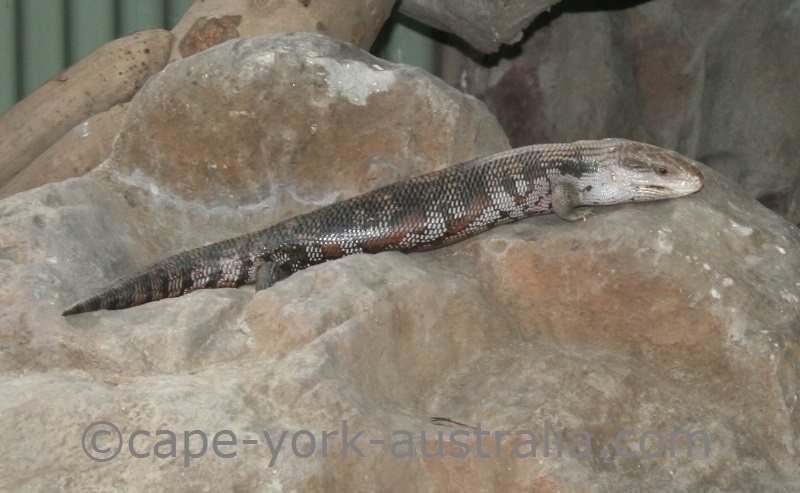 Blue tongue skinks are the largest of all Australian skinks. They are slow moving and easy to get close to - they don't run away but stick out their impressive tongue when threatened. You may well see one on your travels, basking in the sun in the mornings or foraging in the midday heat and afternoons. They could bite when picked up, but they are not poisonous. Skinks is a very large group of reptiles in Australia, with 300 members, and blue tongues are the largest members of the group. There are six species of blue tongue skinks in Australia: Eastern (Tiliqua scincoides scincoides, aka Common), Western (Tiliqua occipitalis), Northern (Tiliqua scincoides intermedia), Blotched (Tiliqua nigrolutea), Pygmy (Tiliqua adelaidensis) and Shingleback (Tiliqua rugosa). They have a large head, small legs and feet, and a bulky body that can grow up to 45cm in length (but most often less). They have a fat tail where their spare food and water is stored. Their body is creamy to grey with a pattern of brown stripes on their smooth, overlapping scales. And most famously, they have a bright pink mouth and a bright blue tongue, which emerges when the animal feels threatened. Like most other reptiles, they don't produce own body heat but depend on the outside temperature. That is why you see them sun basking early in the mornings, when the air is not too hot and not too cool. When it gets hotter in the middle of the day and early afternoons they become more active and get around foraging. When it's cool at night time, they become inactive and sleep in their hideaways. They eat both plant parts and small animals, such as insects, caterpillars and smaller lizards, whatever they can get. Snails are their favourites (probably because they are slow and easy to catch), and blue tongue skinks have got strong jaws to break their shells. Blue tongue skinks are eaten by birds of prey, kookaburras, and poisonous snakes (King Brown, Eastern Brown, Red Bellied Black Snake), but also feral cats and dogs. They like to live in open country with long grass, logs, rocks, leaf litter and other ground cover where they can hide from predators. When threatened they stick out their blue tongue, which will confuse some predators. If it does not help, they may hiss and make themselves look bigger by flattening out their body. If grabbed by the tail, they can drop it as many other lizards do. The tail grows back but as it is their food and water storage they need good supplies meanwhile. If they can avoid predators, they can live up to 20-30 years. 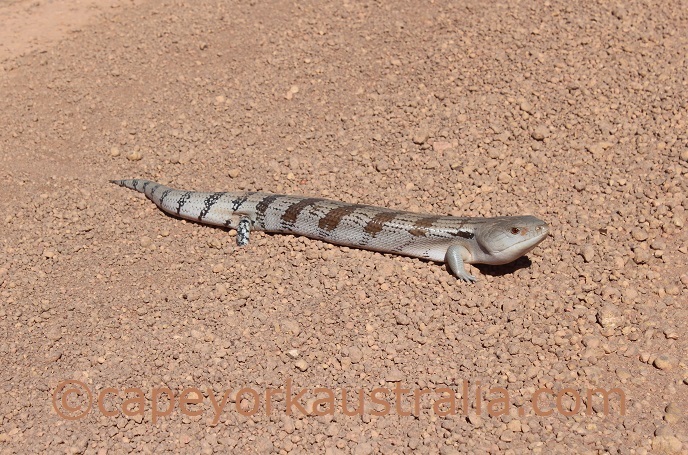 The species that we have in Cape York is the Northern Blue Tongue Skink (Tiliqua scincoides intermedia). 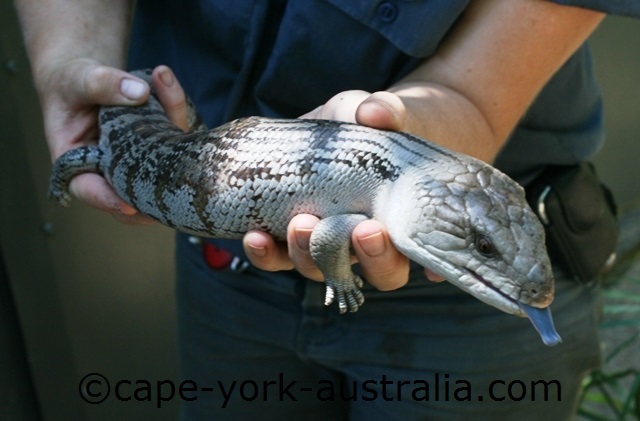 It is the largest and the heaviest of all the six species of blue tongue skinks in Australia. They also have a different pattern and tend to be more yellowish, even orangeish, in colouring.